Published by Enitharmon Press 2010: for more information click here. “This is a wonderful book of poems – charged with a quiet intensity, with a sense of drama filtered by intelligence. The poems speak with a voice of battle-weary, passionate celebration. It seems to me it is concerned with meditating upon both the spiritual and physical worlds (both of mankind and nature), upon the conflict between life and death, youth and age, change and lack of change [. . .] Time, craft and the fires of experience fuel this collection of poems. This is a book which gradually fascinates. You don’t notice each poem falling in step with you and then you suddenly find it has grabbed you by the collar and is leading you somewhere important, somewhere that matters…” Mike Loveday, Eyewear. Read the full review here. 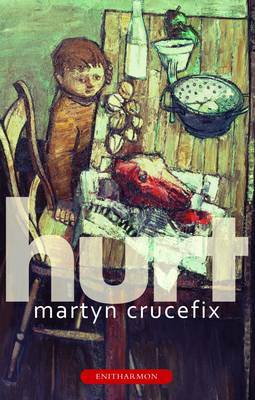 “From first to last, Martyn Crucefix’s impressive fifth collection offers writing of quality and worth. Arranged in three sections, its fifty-one thematically and stylistically varied poems nevertheless achieve a telling unity in both the seriousness of their subject matter and the poet’s exact and detailed observation of it [. . . ] Hurt investigates important questions, some merely difficult, others imponderable. Ken Head, Ink, Sweat and Tears. Read the full review here. “Martyn Crucefix is concerned in his new collection Hurt with how human beings relate, though his collection considers pain and how it separates us rather than unites us [. . . ] and, like Rilke, his language is intense, compressed and vivid. Zoe Brigley, Magma. ‘Water lily’ from Hurt in Poetry London: here. – ‘He considers what the young have to teach’ from Hurt on Verse Daily: here. – ‘While there is war’ from Hurt in The Cortland Review (USA): here. – ‘Growth of a poet’s mind’ from Hurt in Bowwowshop: here. – ‘Can Torras’ and ‘Cell’ from Hurt can be read at nth position web site. Nightjars, lilies, beetles, poems by Stalin, Whitmanesque despatches from an American war, the flight of refugees, ambiguous revolutionary cells, Homer’s Ithaca, the lives of Petrarch and Keats. Such items fill the table-top. But the boy does not climb to it. He does not clamber down and away. The tensions that animate Martyn Crucefix’s fifth collection are those between openness and closure, vulnerability and defiance, liberal and fundamentalist. Bearing the impress of his acclaimed translations of Rilke’s Duino Elegies, this book moves towards an openness to experience that is always threatened by the facts of suffering. Less about what hurts us, more how we respond to it, the reader is carried towards an affirming, comprehensive vision that declares “this, this is mine”. must bring us to ourselves. the sounds of this house. A hammer and a nail. with the elevation of wealth.